Alasdair Lemon from Buglife will deliver this Entomological Club seminar entitled “Marvellous Mud Snails”. It will be held at the James Hutton Institute in Dundee (and screened to the Institute’s Aberdeen site). Alasdair Lemon is the Conservation Officer for the Marvellous Mud Snails project. 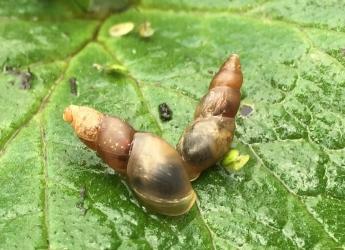 Buglife are working alongside partners (Royal Zoological Society of Scotland, Scottish Wildlife Trust, East Dunbartonshire Council, North Lanarkshire Council, Clackmannanshire Council, Forestry Commission Scotland and West Lothian Council) to secure the future of the Pond mud snail in Scotland through their HLF funded Marvellous Mud Snail Project. The project has three key areas, practical conservation, public engagement and education. Alasdair will be discussing what the project has achieved to date and what is planned for the last 6 months. The talk starts at 4 pm with light refreshments available from 3.30 pm.